-There were 248 reported sales in the MLS that sold in 2013. The total number of homes sold has increased by 4% compared to 2012 total of 239 homes sold. -Average sales price in 2013 was $1,462,195. The average sales price has increased 14% compared to 2012 when the average sales price was $1,287,516. -Average price per square foot in 2013 was $512.51. The average price per square foot has increased 14% compared to 2012 with an average price per square foot of $451.36. -Average days on market in 2013 was 61 days. The average days on market has decreased 16% compared to 2012 average days on market of 71 days. -Average selling price to listing price in 2013 was 100.38%. The average selling price to listing price has increased by 2.5% compared to 2012 average selling price to listing price of 97.90%. -There were a total of 10 Short Sales in 2013. Short Sales have decreased 40% from 2012 which had a total of 14 Short Sales. -There were a total of 4 REOs in 2013. REOs have decreased 67% from 2012 which had a total of 12 REOs. 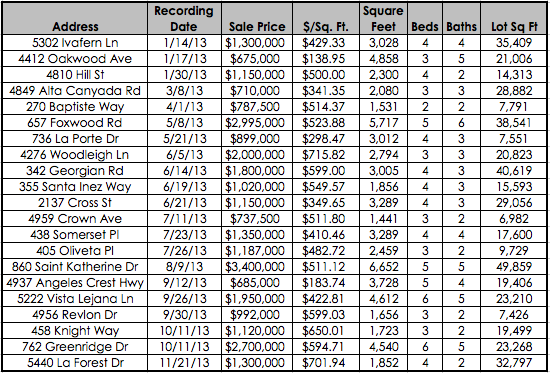 There were 21 pocket listings (off market sales) that sold in 2013. The most expensive off market sale was on Saint Katherine Drive. The home sold for $3,400,000 in August 2013.